My plan tonight was just to update the Texas Star Ticker in the right sidebar, which you can see is now up to Number 120. But I found two weeks of photos on my camera which provide an interesting (I hope) cross section of what I've been working on, so I thought I'd share a few. This still photo is from the tv drama Betrayal, on ABC in the U.S. and on City here in Canada. If you've been watching, you know it is about an affair between two married people, Sarah and Jack. The quilt is an interesting prop here. In the scene Sarah is sleeping in her studio after her husband has discovered the affair and kicked her out of their apartment. To me, the use of the quilt implies that by leaving her marriage Sarah has returned to a more wholesome way of life. Throughout the series, so far, there's been the suggestion that the affair is somehow more moral than their two marriages, his to a corrupt developer's daughter and hers to an ambitious prosecutor who's using her to forward his career. It will be interesting to see how it ends! 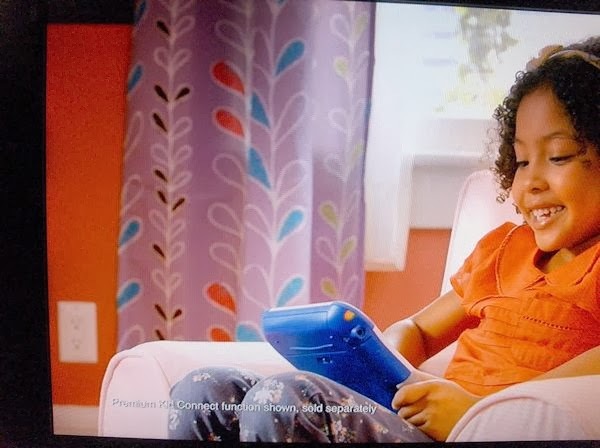 I think this is a Leapfrog commercial. But look at those cool drapes! They could be a stitching design, or a quilting design, or even an applique design. Plus, they remind me a lot of that Orla Kiely fabric and wallpaper design that has become an instant modern classic. 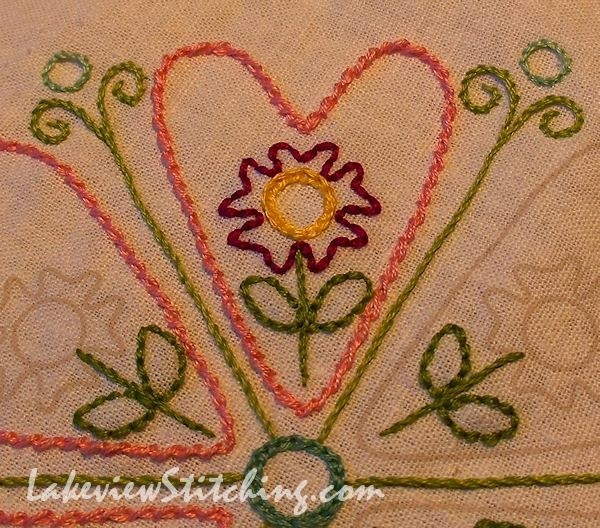 I've been doing the hearts in twisted chain stitch, which I'm very pleased with, but more on that later. The blue looks very electric against the petals, which have a slightly grey undertone, and the olive leaves. It clashes, but just a little, and I'm starting to think I like that, the more I look at it. For a while now I've been trying to break away from "safe" colour schemes, but I'm not sure if this is the right way to do it. What do you all think? I appreciate your thoughts, Audrey. I have a feeling that most of my blogging friends will like the blue too. It does rather make you grit your teeth in real life, though! But then again, once it's cut and pieced the shadows and highlights will blend it in more. I may have to just try it and see. Thanks for the encouragement! We always yell out out " Quilt! Quilt !" if we see a quilt on TV. That twisted chain stitch looks great, it really makes a great chain pattern. I think the blue looks really fun but what we see in photos is different from real life. 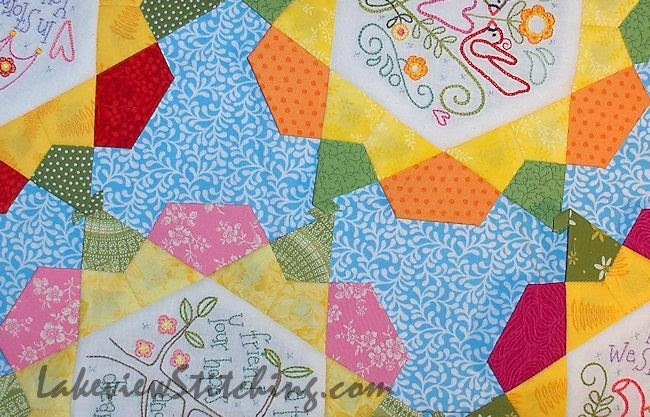 You've put so much work into those beautiful blocks with their handpiecing and stiching that you should only use a backing you are really happy with. You could always use the blue as the backing or it will be perfect for something else if you decide not to use it. That is a very good point, Rachael, thank you. I won't close off any other possibilities just yet. I often yell at the tv too, but it is more often along the lines of "hey, don't walk backwards into that dark room!" Somehow Jillian's comment ended up on another post, but I'll copy it here -- I envy your observation and focus while watching TV. I follow the storyline, but rarely observe details like setting. Your analysis sounds very plausible. From the photos I like the new background quite a lot. It looks great with the green bits, and the orange is particularly pleasing, but granted it may look different in reality. Now I'll reply, lol. Thanks, Jillian! I have a little experience in the theatre, so I have a lot of appreciation for the work behind the scenes as well. Everyone does seem to like the blue. We'll see what happens after I wash it -- it may soften it a bit. I agree with what Rachaeldaisy says about photos looking different from real life. The colours in your blocks are so alive and cheerful that you don't want to detract from them. Your colour choices always work out very well, so go with what feels right to you. The blue work, sometimes we are to close and involved to see the blocks sparkle. It takes a second person who just glance at our project and go, that looks good. It compliment the stitching. Thank you very much, Elizabeth, that is helpful. Welcome! Do you ever see inspiring quilt or stitching ideas on tv?.......haha i don't take pictures, yet' but in last year i keep noticing the soft furnishings on tv and quilts in particular. lol i was watching 'Dome" and one scene they were using about 10 quilts to cover something and i was not interested in the dialogue i was trying to see the quilts lol nice to meet other Canadian quilters. Hi Barbe! Yes, I remember those scenes from Under the Dome too. I thought it was so funny that they were trying to hide the mini dome under a quilt. Again, it seemed like an attempt by the characters in the show to humanize this alien artifact, but it was funny because it just made it look stranger. Anyway, glad to meet you too! I think the colour looks great. 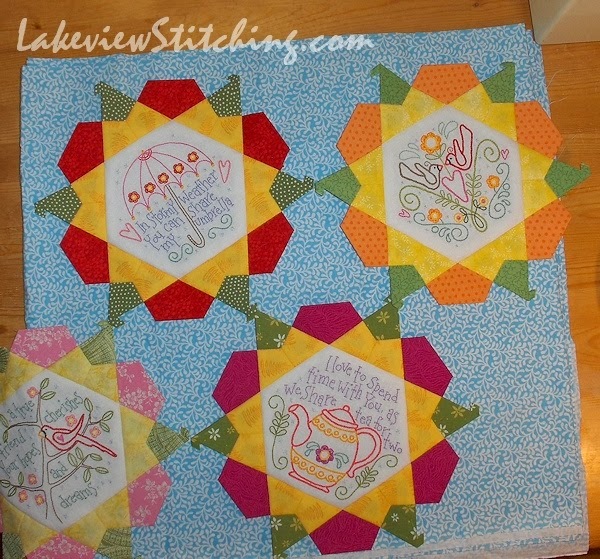 The focus for the quilt is the lovely stitcheries anyway, I would think. I don't have the ability to stop my tv mid-show. That is such a weird concept to me. Weird and wonderful, Janet! I don't know how I got along before we got a PVR. I appreciate your opinion on the blue background fabric. I'm getting lots of great feedback!